Update: This was one of the more popular posts that I shared back in October, but I thought with the beautiful spring weather we've been having and our tendency to spruce up our outdoors this time of year, it would be fun to highlight this post again. Reading back through this post has me excited to make some small changes to our entryway to make it a more happy and welcome place to come home to. I know I swore I'd have a yellow door someday, but I'm thinking it wouldn't look so great with the brick we have going on. I'm thinking of painting it a blue color instead. I think a blue will contrast well and pop against the brick and black shutters. What color would you like to paint your door? p.s. It was fun to go back through and read this and just for the record, Kendall was on board with yellow door idea. Sometimes that guy surprises me. The exterior of your home is the first thing people see when they drive by or pull in to visit you. It should say welcome and make your guests eager to come in and share some coffee and chat or watch Friends reruns with you. If you'd like to give your house a facelift but can't afford a total makeover right now, I've got 6 simple and relatively budget friendly ways for you to update the face of your house. 1. Paint the door. I can't wait until we have our own home someday and I can paint the door. I dream about it. I haven't decided yet if I want a white house with black shutters and a yellow door or a charcoal grey house with white shutters and a yellow door, but I know one thing. The door will be yellow. 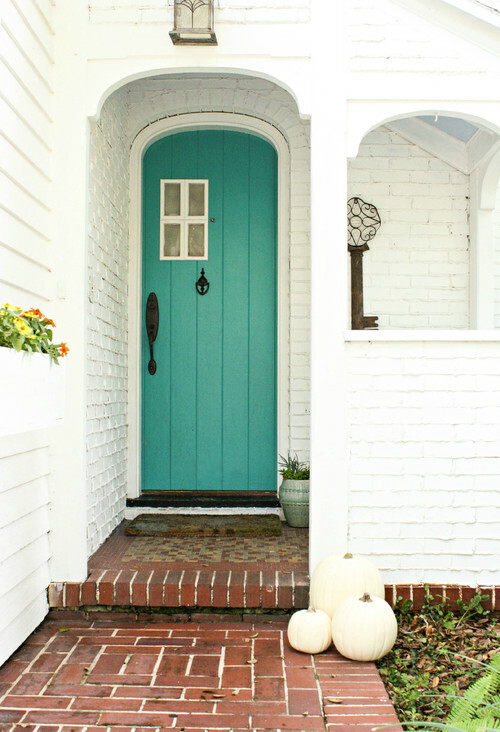 I haven't told the hubs this yet, so I may have some convincing to do between now and than, but I'm sure it will happen ;) I just love a painted door. It adds a lot of visual interest to a home without costing a fortune. I've thought about painting our apartment door, but we've been in good standing here so far, and I'd kinda of hate to ruin that. 2. Hang a wreath. Hanging a wreath on a door is like hanging a necklace around your neck. It just adds a little bit of something special. The hubs says he hates wreaths so I haven't hung one on our door yet, but I've got DIY fever, and I feel a wreath coming to our door in the near future. Wreaths are nice in that they can easily be changed out with the seasons to give your house a quick little update. 3. Add some plants and flowers. Plants and flowers just breathe life into a space and make it feel alive. There are a million different planter options you can choose from to complement your home and style and like wreaths, plants and flowers can be changed out with the seasons to keep your entry looking fresh. One tip I would suggest when adding a wreath and flowers to your entry is to choose colors that complement the color of your door. It can make a huge difference and really make your entry way sing. 4. Add some lighting. If a wreath is the necklace to the door, than lighting is the earrings. Lighting can really draw a space together. Not only does it look pretty during the day, but at night it gives that warm welcome and glow that says people are loved and welcomed here. You can add your lighting overhead or to the sides of the door or both. 5. Update the hardware. Hardware can definitely add some visual interest to your entry way. Design is in the details. You can add a unique knocker, update the hinges, and of course update the door handle itself. You can go with something totally unique or something classic. 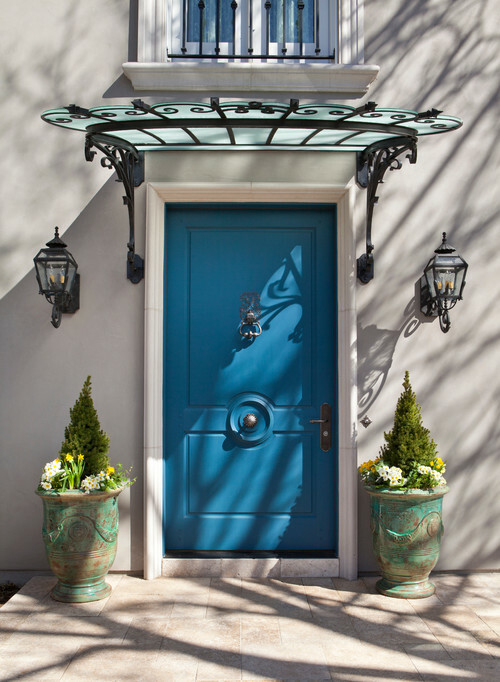 Just ditch the builder grade accessories and add a little special touch to your door. Also, make sure the all the hardware complements each other and doesn't compete for attention. I hope you've found these tips helpful. If you'd like to save them for later, please feel free to PIN them with the image to below, and share them with a friend! Also I'd love to hear your tips for updating your homes exteriors, Leave them in the comments below!